HAVING played in three previous finals Kevin Murray knows the significance of Saturday’s showdown with St Gall’s. 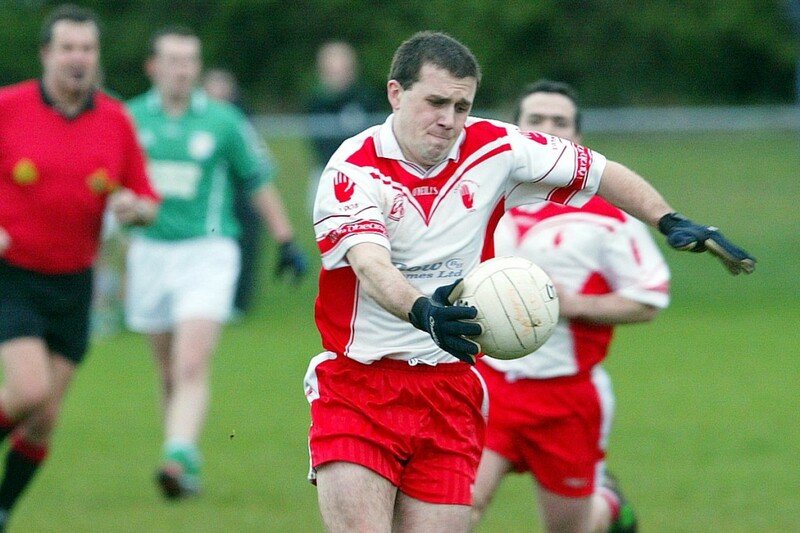 The 32-year-old has come within touching distance of the McNamee Cup on every occasion but each time he and his Lámh Dhearg teammates have come up short. A replay defeat to St Gall’s in 2003 was followed by extra-time heartache against Cargin in 2006. Then in 2008 St Gall’s again provided the opposition and despite leading at the break, the Milltown men’s experience saw them secure the win with a strong second half performance. This year, Murray (pictured) knows that time is running out if he is ever to secure that elusive Championship medal. An added motivation this year is that he will take to the field with brothers Conor and Ryan. Winning with friends is one thing. Doing it with your family makes it even more special. “For me being in my early 30’s I know I may not get many more chances to win one,” said the Sports Development Officer at Queen’s University. “For me the benchmark was to be able to play with my two brothers. Conor is of course a member of the Antrim senior panel while Ryan was part of the successful minor team that won the St Paul’s Ulster tournament at the turn of the year. Tully, Michael Hynes and Declan Stranney to name but a few. Add in established county players like Paddy Cunningham and Brendan Herron and Lámh Dhearg seem to have got a healthy blend of youth and experience, something Kevin Murray believes has been key to their progress in 2011. “They (last year’s minors) have certainly added a bit of resilience to the team in that they are used to winning so it is good playing with them,” added the Lámh Dhearg full back. When the draw was made for this year’s Championship, many people would have expected another St Gall’s v Cargin final as the draw kept the two modern giants apart. However, the Hannahstown men didn’t read the script despite looking dead and gone with ten minutes to play in their quarter-final. Trailing by seven, a Cunningham free seemed to offer token resistance but when Brendan Herron squeezed the ball over the line minutes later suddenly it was game on. What followed next was truly remarkable. Conor Murray’s intercept and shot from 50 metres sailed into the net. Lámh Dhearg finished stronger while Cargin imploded and it was the Red Hands celebrating at the final whistle. A semi-final meeting with Creggan beckoned. On a night of heavy rain, Cunningham’s sharpshooting and Hynes’ industry meant Lámh Dhearg went in with a five point lead at the break and were coasting. This time it was the opposition who fought back, made it a one point game but that was as close as they got. The Hannahstown men steadied and sealed their place in the final. The eldest of the Murray clan explains these results have instilled real confidence ahead of Saturday’s showpiece and feels they are hitting top gear at the right time. “I suppose at the start of the year we were building a new team and the Cargin match was big,” said the former Antrim star. “Nobody gave us a chance in that so I suppose that gave us a bit of momentum for the year. “We were maybe a bit up and down in the league but at the same time we were rebuilding a bit so we are looking forward to this one. “You can only beat the teams in front of you. People didn’t fancy us against Cargin but we got the goals when it counted. “Against Creggan we came out and blew them away in the first half but let them back into it although we got over the line at the end. That confidence will surely be tested at various stages of the game under the Casement Park floodlights. While the previous opposition has been of real quality, this weekend they will face a totally different proposition. St Gall’s are going for five-in-a-row once again. They have been in ruthless form so far this Championship campaign and will surely represent a step-up in class of several notches, although a recent one point league defeat to the Milltown men will give them belief they can upset the odds once again. “You can go in with this whole underdog tag but at the end of the day you have to play well,” admitted Murray. “We will just have to play to our regular game plan that we are used to and just go for it. “Over the years we have always given St Gall’s a good battle. We have played them in a couple of finals and took them to a replay a few years ago. “Three years ago we were up by a point at half-time. We have generally run them close in the league and they just beat us by a point in the league recently. “They are confident and never seem to panic when they are a few points down – they would just grind you down. The bottom line on Saturday is that Lámh Dhearg must perform to their best if they have any hopes of winning their first county title since 1992. Murray acknowledges they need to concentrate on their own game and stick to their task. If they manage to do that he feels that elusive Championship medal may be within his grasp at the final whistle. “Basically we know we are going to have to play really well on Saturday. We know we would have to do that no matter who we play but we will go out and give it a rattle,” he added. “We need to just believe in ourselves that we can push St Gall’s and for everyone to keep going for the full 60 minutes. “That’s what you need in Championship and you never know what way a game will change so we are just going to have to compete to the end.